Kyotofu is one of my favorite places for an all girls get together. Light bites, girly drinks and beautiful yet super yummy tofu desserts. Boys go there too, don’t get me wrong, but they’re usually dragged/arm twisted/threatened by a girlfriend. Basically everything is delicate and real purty, and boys just don’t seem to get it, which is understandable. Below is a compilation of my many visits. Their tapas-ish style dinner menu have certain additions seasonally, but along with the chicken & tofu sliders comes a side of really yummy and crunchy lotus root chips, I wish they’d package and sell these in Costco sized potato chip bags. The sliders are ok, not much flavor. Japanese Curry Puffs are quite savory, and so are the pigs in a duvet, which are very buttery, but nothing out of this world. Same goes for the Unagi wrapped in phyllo dough and the Smoked Salmon Onigiri, all good, but nothing to go back for. And the main ingredient “tofu” doesn’t seem to make any stunning appearance here. You can also MAKE YOUR OWN TOFU, which is quite fun. Done tableside, you put the ingredients in the pot and let it simmer, minutes later, voila! 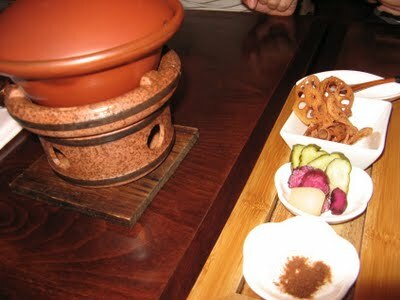 the white liquid turns into a solid yet very soft and silky tofu, served along the addicting lotus chips and a variety of pickles. 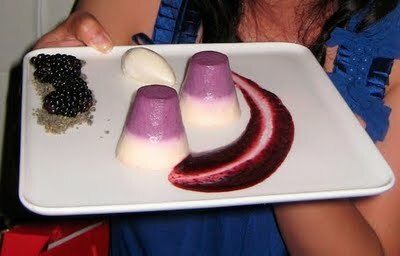 Now to the Tofu Desserts, the reason I keep going back. Ok so when you first hear about “tofu” made dessert, you might cringe like I did, but I also have the curiosity of a 5 year old, so I was open to trying, and surprisingly fell in love with them. Mind you, made with tofu doesn’t mean no sugar, flour or butter, so I’m not sure how “healthy” they actually are, but they’re yummy and that’s all I care about. 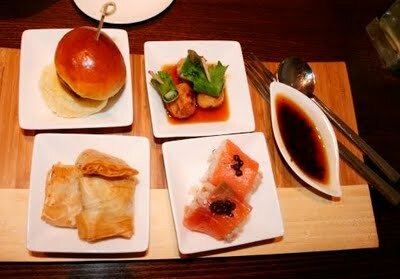 All desserts can be paired with their selected sakes. My all time favorite is their version of Strawberry Shortcake. A layer of fresh strawberries, pieces of sansho pepper shortcake, and cubes of sweet chewy jelly, topped with tofu cream, yes, you heard me, tofu cream! sounds odd but taste really fluffy and creamy, and I assume less fat content than actual cream, A+ for that. 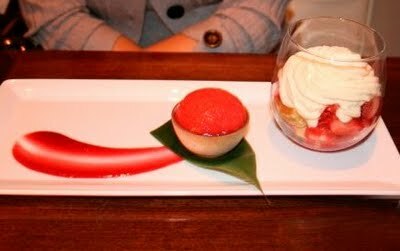 Sweet but not overly, and the scoop of strawberry/sake sorbet is tart and refreshing, with just a slight reminder of alcohol. It feels light and very summery. Plus it’s like a dessert and drink all in one. Black sesame makes everything more fragrant, like ice cream, and numerous asian desserts, so having a Black Sesame Sweet Tofu was a no brainer. 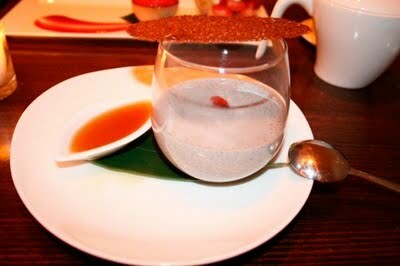 This one comes with a black sesame tuille on top which is very crunchy and sweet, a little goji berry (which we usually use in cooking rather than eating it plain), and a roasted green tea syrup. I love their desserts because they aren’t loaded with sugar, just a hint of sweetness, and you can control it by adding more or less syrup. This is excellent, very light and smooth, keeps me wanting for more. If your not into black sesame, there’s always the Signature Sweet Tofu, which comes with a japanese kuromitsu black sugar syrup to sweeten things up, and dried apricot on top. Sure, you can buy sweet tofu dessert for much less at the corner of Grand and Chrystie St in chinatown, but this is quality, not quantity. The chinatown one is still good, but this is silkier and way more delicately put. And the syrup is so much more intense, little details make a big flavor difference. During summer, they had this Blackberry Tofu Cheesecake, which was spectacular, but I guess it’s seasonal, since it’s no longer on the menu. Tofu cheesecake actually tastes just as creamy as the real thing, very creamy and rich. Right now they have an passion fruit version. 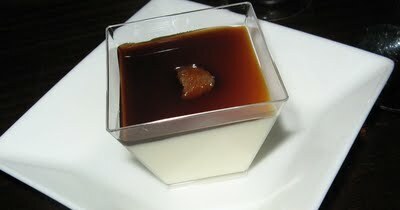 If you can’t decide, you can always go for the Kyotofu dessert Kaiseki prix fixe, 3 courses chosen by the Chef. 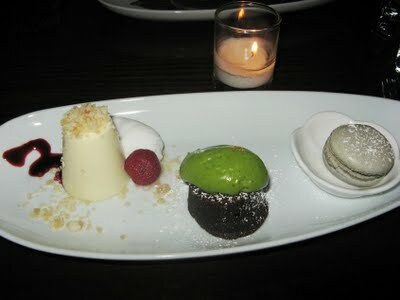 That day, I had the Passionfruit Tofu Cheesecake, with coconut sorbet and yamamomo mountain peach (that red round thing, which is actually a fuzzy textured berry/plum, you can get these in snack form at chinese grocery stores, I actually loved them as a kid). 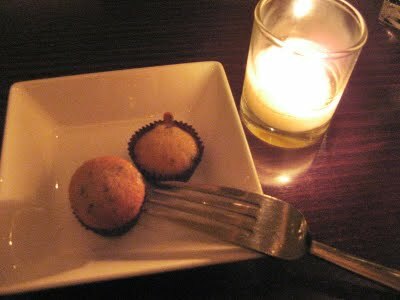 The passionfruit had a little bit of tartness, and there was an explosion of coconut flakes and flavor, very delish. Also came with the warm miso chocolate cake, which had no miso flavor, but it did use Valrhona chocolate and a soybean ganache, topped with green tea cream, pretty luscious and rich. I felt cheated with the french macaroon, although it was good, I would of picked the rhubarb-strawberry cobbler, which sounds a lot more interesting. The meal is always complete with a complimentary little bite. This time, they had these mini Shiso Leaf (herb in the mint familia) cupcakes, so cute, I had to take a pic in relation to the fork, and mighty tasty. No tofu here, just butter, sweet o’butter and I ain’t complaining. I'm impressed with the homemade edamame tofu, and the crunchy lotus root chips! I'll have to schlep myself to the west side for a visit there! Great post, girl! I love this place. It looks outstanding and so much fun. I love the diary writing, too. Keep it up! Thanks for the comment under the Isaac post. To answer your question, I just moved here a few months ago, and I'm still trying to settle in. I haven't decided what I will be doing for a living. I used to work in finance, but that industry is in disarray currently. Anyhow, what do you do for a living? Hey since you're in midtown pretty frequently, let me know if you'd like to meet up for lunch or coffee. It'd be fun to know a fellow blogger. If I ever make a trip to NY with my mom, i will have to take her to this place, she loves tofu. Greetings i am a newbie here and think this forum is intresting. I am going to contribute here and hopefully stick around! just wanted to say hi.